During a safari tour you try to be the first to photograph each of the 10 different animals (elephant, lion, tiger, giraffe, zebra, buffalo, ape, squirrel, crocodile and turtle). Both players (the yellow and red camera) start in a corner of the 10x10 board. The landscape has forest and lake spots (each game at other places) and 10 animals spread over the land. Below a possible set up after the start of the game. The initial places of the animals are always the same, but sometimes animals are move 1 spot away if it was placed in the forest or lakes (for example the animal on g7). In your first turn you can only move horizontal or vertical (alike the rook in Chess), not diagonal and not on or through a forest or lake. Or you pass, to stay at your start space! In later turns you must move, unless no open spaces are available. You move in one direction, orthogonal or diagonal. You can move as far as you want (alike the queen in Chess), but not on or through spaces with forest, lake or an animal. You can move through the space occupied by the other player, but cannot end in that space. When you are in the space at a side or front of an animal, you take a photo. (The front of the animal is at the arrow point side. The opposite side is the backside of the animal, you don't take photos of its backside!) You can take photos at the end of your move (not during your move) and after the animals moved. The flashlight shows that you photograph a new animal. You can photograph several animals at the same time. The colors around the animals show which player needs to photograph which animals. Below an example where yellow just took a picture of the animal on b2. Each round, after both players had a turn, all animals move 1 step. First the animals in the upper row, then the animals in the second-highest row and so on. In case of several animals in the same row, the animal most left in the row moves first. 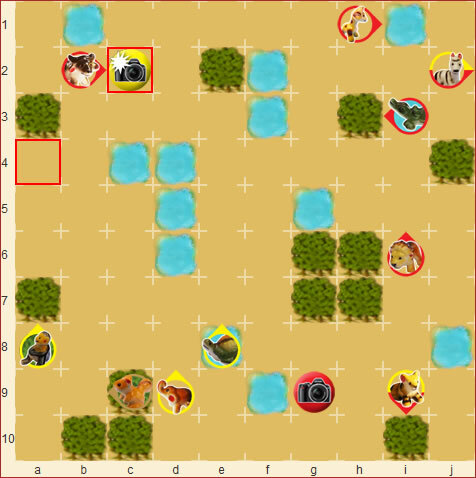 An exception can be the last move if before the movement 1 player (or both) already photographed 10 animals (see also End of the game). How do the animals move through the landscape? The animals move forward (in the direction of their arrow). But they get blocked by forest, lake, another animal, a player or the edge of the landscape. When an animal isn't blocked: It moves 1 space forward. When an animal is blocked ahead and to its left OR its right: It turns one quarter and moves to the free space. When an animal is blocked in all directions except behind it: It turns around and moves to the free space. AWhen all 4 spaces around an animal are blocked: It turns around (180 degrees) but doesn't move. When an animal is blocked by anything else (and not by forest) and both side spaces are open: It turns (90 degrees) and moves rightward. Exceptions: The turtle and crocodile are not blocked by lakes, the squirrel and ape not by forest. Such spaces are equal to ground spaces for these animals. Winner is the player who photographs the 10 different animals first. Both players play an equal number of turns. So if both players photograph their 10th animal in the same turn, then the game ends equal (1-1 in the tournaments). It also ends equal if both players photograph their 10th animal when the animals move. The game also ends when both players played 40 moves (the animals do not move after that move). The player with the most photos wins the game, if both player have the same amount of photos, the game ends in a draw. Safari is a game of Corné van Moorsel and published as boardgame (name: *Tricky Safari*, 2-4 players) by Cwali.